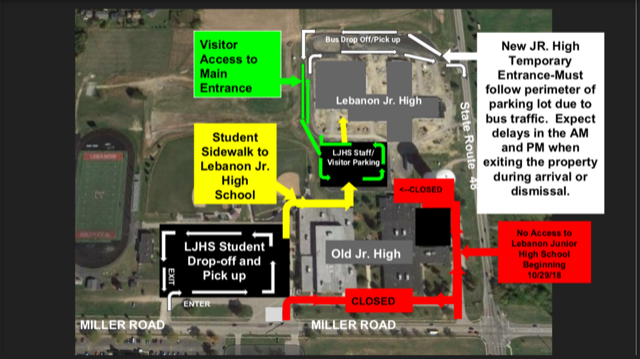 Beginning on Saturday, October 27th, visitors will no longer be able to access LJHS from Miller Road. All traffic will have to enter the parking lot from SR 48 as the old junior high building will be fenced off in preparation for demolition. This is going to create changes to morning and afternoon traffic patterns. All vehicles will enter from SR 48. Traffic will be routed around the exterior perimeter of the rear parking lot and around the building (the practice football fields) to the front lot. Once at the front of the building, cars will turn right to travel around the perimeter of the lot by the softball field, by the old junior high, by the water tower and to the front of the building. After exiting the front lot, cars will again travel to the rear of the building (by the practice football fields). Once at the back lot, cars will turn right and travel by the dumpsters, sidewalk, and courtyard to exit the lot by turning onto SR 48. Please see the attached map for more information. Please note there may be delays leaving the lot in the morning and afternoon during arrival and dismissal. These delays will be to ensure student safety while student load and unload buses. No cars will be able to exit the lot from 2:05 to 2:18. (1:05 to 1:18 on Wednesdays.) If you have an appointment, please plan accordingly and pick your student up early if necessary. Click Here to Access Map.